President Trump is expected to announce his Supreme Court nominee Tuesday, nearly a year after Justice Antonin Scalia died. He isn’t the first president to nominate someone to fill Scalia’s seat — President Barack Obama’s pick, Merrick Garland, languished without a Senate hearing for 10 months — but that doesn’t take away from Trump’s opportunity: This is a pick that could shape the court for decades. Based on the potential nominees mentioned in the press so far, whoever he names is likely to be to the right of Justice Anthony Kennedy, a Ronald Reagan appointee who is often the pivotal centrist on the court. 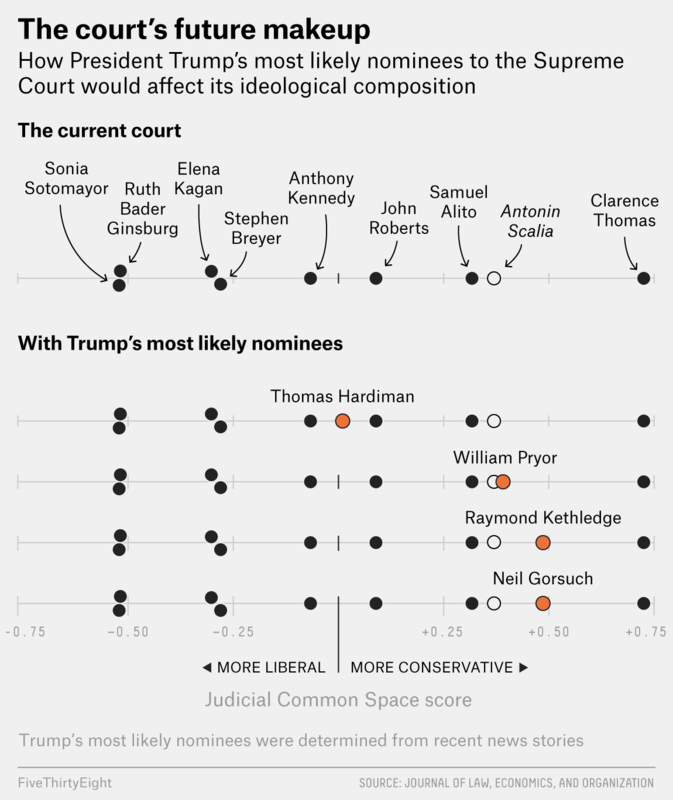 And depending on whom Trump selects, his nominee may even be more conservative than Scalia was. Two federal judges — Neil Gorsuch, of the 10th Circuit Court of Appeals in Denver, and Thomas Hardiman, of the 3rd Circuit in Philadelphia — are frontrunners for the nomination, according to CBS News. “Gorsuch has a slight edge,” CBS claims. Other outlets, such as Bloomberg and the Washington Post, lengthen Trump’s reported shortlist a bit to also include William Pryor and Raymond Kethledge, federal judges on the Atlanta-based 11th Circuit and Cincinnati-based 6th Circuit, respectively. All four men were appointed to their current judgeships by George W. Bush, and would almost certainly espouse positions to the right of the average on the current court. But exactly where they’d sit, ideologically speaking, could vary widely. Determining how a judicial nominee would behave on the court is tricky — nominees’ past records often don’t offer a reliable hint. But research has found that one factor does prove useful: the ideological makeup of the people who nominated and confirmed them. The nomination of Gorsuch, Pryor or Kethledge would probably lead to the addition of a solid, reliably conservative voice and vote on the court, Gorsuch and Kethledge maybe somewhat more so. None of the rumored justices, however, would likely be to the right of the court’s silent bulwark, Justice Clarence Thomas. Some of the justices stand out. The frontrunning Gorsuch has a shiny patrician resume. He studied at Columbia, Harvard and Oxford and clerked for Justices Byron White and Anthony Kennedy. Hardiman, meanwhile, looks like the centrist of the group. According to the common space scores, he’d fall somewhere just to the left of Chief Justice John Roberts and just to the right of Kennedy, often the court’s swing voter. But despite the centrist score, Hardiman’s record does reveal conservative bona fides, as SCOTUSblog laid out: He has taken an expansive view of the right to bear arms, voted against inmates in death penalty cases and proven unsympathetic to many free speech claims. Also notable for a court that may face a challenge to its past ruling in Roe v. Wade: Hardiman has not yet ruled directly on abortion issues. That does not appear to be what Trump is hoping for: He has promised to appoint a justice “very much in the mold” of Scalia, who never ran any risk of “super median” status. Pryor appears to fit well in Scalia’s ideological shoes, but what are the other dimensions of the Scalia mold? A team of attorneys and academics recently released a working paper titled “Searching for Justice Scalia” in which they attempt to measure the “Scalia-ness” of potential nominees. Of the shortlisted four, Gorsuch was by far the most likely to invoke originalism — the notion that the Constitution is not a “living” document and that its meaning was fixed when it was enacted — in his opinions, as Scalia had a habit of doing. Pryor, on the other hand, was the most likely to cite Scalia’s writing. But Kethledge was the most likely to write non-majority opinions, in Scalia’s fiery oppositional style. In the end, Gorsuch won the researchers’ Scalia lookalike contest by a nose. One wonders if Trump’s team has read the paper. While the ideologies of Supreme Court justices are calculated using their votes in actual decisions, for federal judges they are calculated solely based on the appointment process.